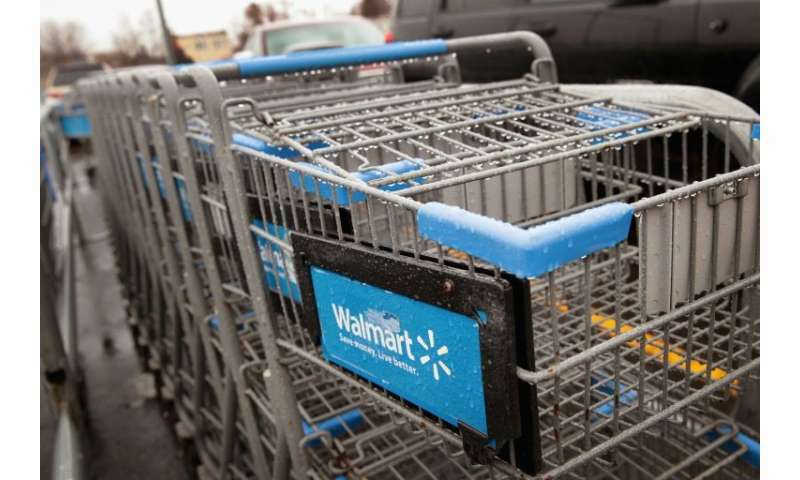 US retail giant Wal-Mart saw quarterly profits take a hit but earnings beat analysts' expectations and total sales rose amid the growth of online sales, according to results released Thursday. Net income was down $905 million from the same period last year at $2.134 billion. But the key earnings per share measure was $1.14, two cents higher than expected. And net sales, at $121.6 billion, were up 4.4 percent over the same period last year—more than $1 billion higher than expectations. Wal-Mart, which is trying to compete with online giant Amazon, saw US comparable store sales rise 2.1 percent and customer traffic increase 0.8 percent, although the unseasonably cold weather hurt sales in the United States. US online sales surged 33 percent compared to the same period of the prior year and added a full point to overall sales growth. "We are changing from within to be faster and more digital, while shaping our portfolio of businesses for the future," Walmart chief Doug McMillon said in a statement. The company's chief of e-commerce, Marc Lore, told reporters the chain was on track to meet its expectations for 40 percent growth in online sales this year. "We're playing offense," he said in a conference call. He noted the company was beefing up jet.com to focus on more affluent millennials in major US cities where Wal-Mart has lower penetration, which includes "a full range of Apple products." Wal-Mart also is pushing its online grocery sales, which figure more prominently on the store's homepage, and 800 stores will have delivery this year. The company also added a partnership with upscale department store chain Lord & Taylor to its offerings which will bring more brands to its customers. The recent purchase of Indian online marketplace Flipkart announced earlier this month also figures into the company's global expansion plans. In its guidance, the company cautioned that the deal was expected to negatively impact earnings per share in the current fiscal year by $0.25 to $0.30 if the transaction closes at the end of the second quarter. Meanwhile international sales jumped 4.5 percent, with increases in comparable store sales in eight of the 11 markets, notably in Mexico. The decrease in net income is primarily due to a change in accounting policy related to Wal-Mart's 2016 equity investment in Chinese online distributor JD.com, of which Wal-Mart holds a little more than 10 percent. The company's stock was up after markets opened but by midmorning had fallen nearly one percent to $85.23 amid a broader market selloff.